Self, can I be excited about this now? In public, I mean. Dust on the Wing – available for preorder! Part of the forthcoming Solitary Travelers collection at Less Than Three Press, DotW is a sci-fi novella with a grey-a protag and its existence is a perfect example of well that escalated quickly. Truth: I had not written anything longer than a blog post since 2012. Link-hopping brought me to this call for ace characters wandering the universe and friends, that is my life. Fervent word-juggling ensued, and I can still recall the sense of accomplishment once I got to the end of the first draft. Several drafts later, here we are! Now with a beautiful cover by Aisha Akeju that I swoon over every time I see it. 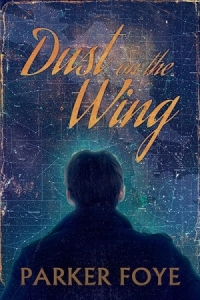 Dust on the Wing will be released on March 16, 2016, and is currently available for preorder.